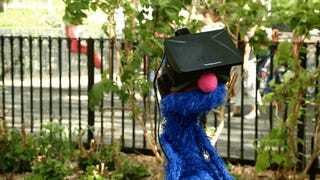 In this video from Mashable, the Sesame Street crew, along with Zachary Levi sing about the wonders of putting down your technology and going outdoors on a sunny day. Maybe they just haven't bought into our all virtual reality future. Here are the lyrics, and the clip with Grover and the Oculus is at 1:31. Chatting with my friends and making plans. Bees are always buzzing 'bout the flowers they have seen. Yo, this Snapchat is going to be cray! No hashtag selfie, put that thing away. That now we're running faster than 4G! On the playground there's a million games to play. The Bees are always buzzing 'bout the flowers they have seen. Weather app to tell you that. Subscription to this cloud is free.